Cardamom is not a common addition to most home spice cabinets. It comes in two closely related varieties: the green (which most people will have at least tasted at some time or another), and the black variety, which is larger and far less well known in western cookery. Green cardamom, although not widely recognized, is used in quite a few bakery products, especially in Scandinavia, and it is likely in these types of products that most people will have encountered it. Green Cardamom (genus Elettaria) and Black Cardamom (genus Amomum) are both members of the ginger family. They are closely related, as such, but the flavor of each is very different. Both varieties are most closely associated with the cuisines of India and Pakistan but it wasn’t until I read Fuchsia Dunlop’s excellent Sichuan cookery book ‘Land of Plenty’ that I discovered it is also used in western Chinese cookery, where it is known as 草果 (pinyin: cǎoguǒ). The Chinese name, if you are interested, translates as ‘grass fruit’. 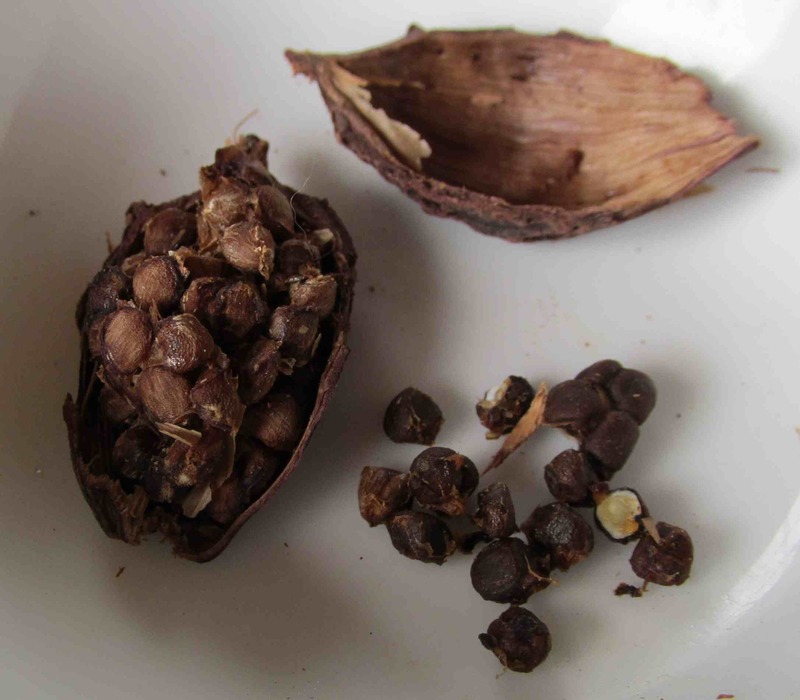 The pods of Black Cardamom have a very thick, woody hull and, when cracked open, reveal a mass of tiny blackish-brown seeds held together by a rather sticky resinous material. The aroma, which is very much reflected in the taste, will be instantly familiar to those who use ‘Vick’s Vaporub’, or other similar products, as it is heavily redolent with the distinctive smell of camphor. 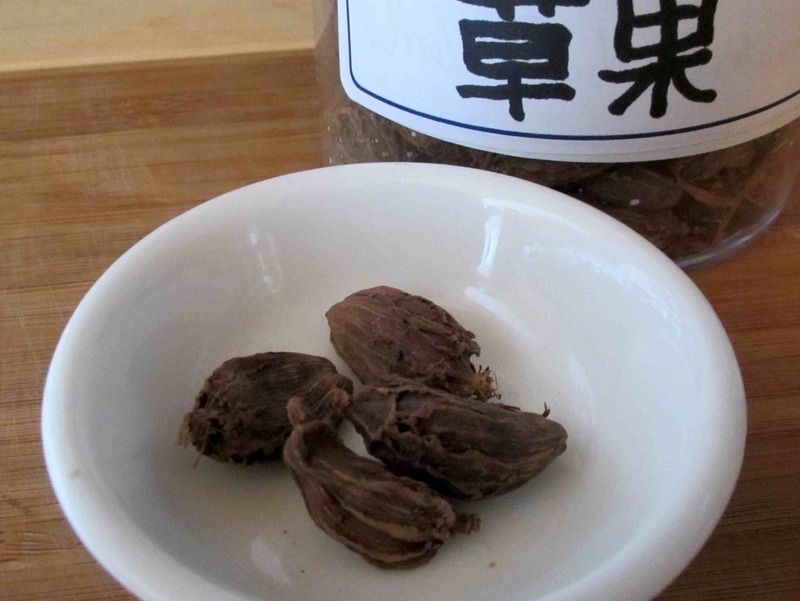 If you taste the seeds raw from the hull it will be the camphor quality that dominates. However, notes of pine resin also come through and there is also a woody, smokiness to the overall taste that comes, apparently from the practice of drying the pods over hot wood fires. It probably sounds, I am sure, that this strongly flavored spice might be actively unpleasant in most culinary uses but, in fact, the strength of the camphor diminishes considerably when cooked and the smokiness comes through very nicely when used with many meats. Indeed, if used with some discretion, the spice can add a pleasant wood-smoke quality in the same way that bacon can when included in stews and chowders. It is also possible to buy Black Cardamom in a powdered form, as you see above, but I would counsel against this. The powder you see above is already a good two years old and I am afraid that it has completely lost its potency and is ready to be discarded. 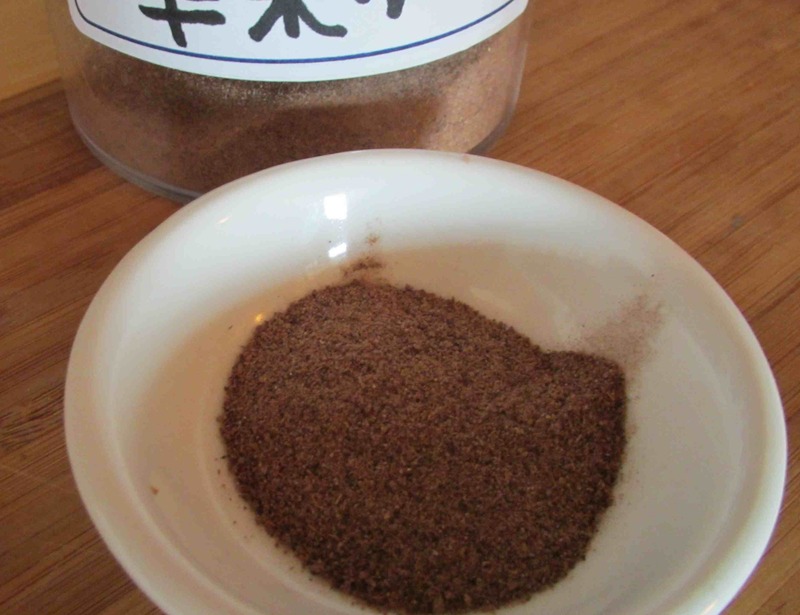 Most home cooks will only use this spice occasionally, and a little goes a very long way, so it is far better just to buy the whole pods and grind the seeds as needed instead. The pods I have (which can also be used whole in some dishes) are just as old as my powder and, as far as I can detect, are every bit as potent as when I first purchased them. In India and Pakistan, the spice is added to a number of blends, especially some versions of Garam Masala. It tends to be used with meats more than vegetables and is especially good with lamb. In Chinese cookery, it is mostly limited to the west, and is sometimes added to certain long-simmered dishes along with chili. I have used it a number of times in hotpot style preparations containing beef and daikon and I recently used it, to pleasant effect, in a dish of Beef with Cumin and Scallions. Extract the seeds from one or two cardamom pods or, alternatively lightly crush the hulls of 3 pods so that they crack but do not break entirely. Melt the butter over moderate heat in a saucepan and sauté the onion just until it starts to brown a little. Add the rice and stir until all the grains are coated and they begin to toast slightly, and then add the salt, the cardamom (seeds or pods) and the water. As son as the water begins to boil, cover the pot and simmer on low for about twenty minutes. Fluff the rice and serve. I just checked – I don’t have either in my spice cabinet. You’ve made me curious about the taste of cardamom. I really like the green variety, a few of them crushed and then added to Darjeeling tea. Check out the green variety first. It’s easier to find and a bit more versatile. Try adding four or five pods to rice when you boil/steam it …. very nice! hello.. we are traders, basically exporters of black cardamom and it was really nice to see how you have introduced the aroma and tasste of this spice. We are planning to restructure our website, we would like to know if you would like to associate your blog with us. We also deal in bay leaves, black cumin and black sesame seeds. At the local outdoor market, there is a food stall with all different spices from all over the world – I will need to try cardamom. Thanks for visiting/liking my blog, too. I love green cardamom, and reached for it only yesterday, but now I’m very curious to try the black! The green cardamom is one of my favourite herbs, but I’ve never tried the black before. Really curious to find out more, especially since it’s apparently also used in Chinese cuisine?! Wow, I feel slightly ashamed I don’t know if it. I am Danish and your are right, in Scandinavia we use it all the time in baking. I always use cardamom in cinnamon rolls ect. Cardamom is a wonderful spice for so many things! Most people in Canada will likely only encounter cardamom in a few baked goods and then only so infrequently that they will probably not be able to identify the flavour. Thank you very much … I’m sure my readers will enjoy this too! Oh … those do look delicious, don’t they? I recently added caradamon to a cauliflower curry and it really overwhelemd the dish, I need to experiment more to get comfortable! Thank you! I love green cardamom, but the black pods I’ve tried have been rathr bitter and woody… maybe I ought to try them again! Nice! I recently re-discovered cardamom at a local coffee shop where they make a Turkish Latte. It’s got honey and cardomom in the latte and it is really delish! I can’t believe that I never heard of black cardamom and I have read two posts in the last two days talking about it. As you rightly mentioned, we use it in a lot of Indian preparations.. but interesting to know it’s Chinese name! Grass fruit :). I too love Green Cardamom and keep half a dozen pods in a container of sugar to make cardamom sugar for baking-the smell is amazing! Will try and find some Black Cardamom now. Very, very interesting post-thank you! While I was in NYC, I was at my favorite spice store and found myself face to face with black cardamom. Having read this post, I bought some, naturally. I am so glad I did — what a lovely, smoky flavor. Thanks!